shentongroup has completed yet another seamless generator installation, this time in Portsmouth within a stones-throw of the most spectacular HMS Victory; Horatio Nelson’s 104-gun flagship from the 1805 Battle of Trafalgar. “England expects every man will do his duty”, declared Vice Admiral Nelson. And that’s exactly what project manager Darby Thomas’ team did when it came to installing this PHG250Do generator, housed in a standard canopy. 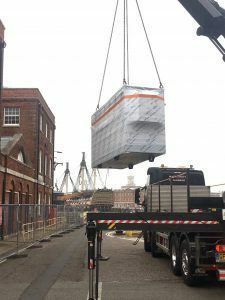 The generator supplies 250kVA of power used to support a number of pumps to help drain the dry docks. 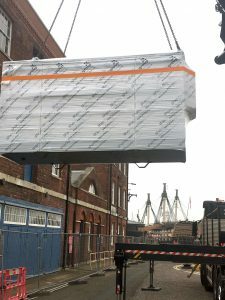 Because one of the docks it supports is a listed building, thought to be one of the oldest in the country, the shentongroup team paid close attention to guarantee the integrity of this generator’s historical location. As the images convey, what a grand position for one of shentongroup’s generator sets. And like all shentongroup generators, this PHG250Do arrived complete with gift wrap and bow. If you spot a shentongroup generator or combined heat and power system en route, then please tweet an image of it with the hashtag #Genbow. For more insight into how shentongroup overcomes challenging installation barriers, watch this short video featuring our Technical Director, Derek Barry, entitled ‘How shentongroup Gets Standby Generators into Awkward Places’. Also, take a look at our whitepapers and case studies for more generator know-how. If you prefer to speak to a member of the UK’s Leading Technical Experts in Standby Power, Uninterruptible Power Supplies and Combine Heat & Power Systems, then click here.